On Tuesday junk bonds continued to crash, the price of oil briefly dipped below 28 dollars a barrel, Deutsche Bank was forced to deny that it is on the verge of collapse, but the biggest news was what happened in Japan. The Nikkei was down a staggering 918 points, but that stock crash made very few headlines in the western world. If the Dow had crashed 918 points today, that would have been the largest single day point crash in all of U.S. history. So what just happened in Japan is a really big deal. The Nikkei is now down 23.1 percent from the peak of the market, and that places it solidly in bear market territory. Overall, a total of16.5 trillion dollars of global stock market wealth has been wiped out since the middle of 2015. As I stated yesterday, this is what a global financial crisis looks like. 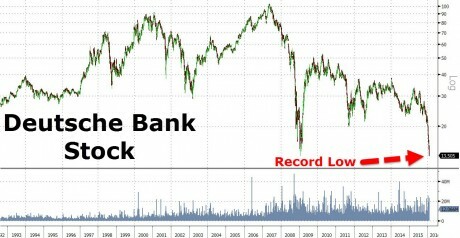 Meanwhile, the stock price of German banking giant Deutsche Bank crashed to a record low on Tuesday. If you will recall, Deutsche Bank reported a loss of 7.6 billion dollars in 2015, and I wrote quite a bit about their ongoing problemsyesterday. And let’s not forget that famous billionaire retail magnate Hugo Salinas Price has warned that the global economy “is going into a depression." Next Canadian Ted Cruz: Does He Have The Documents To Prove He Is A U.S. Citizen And Eligible To Be President?